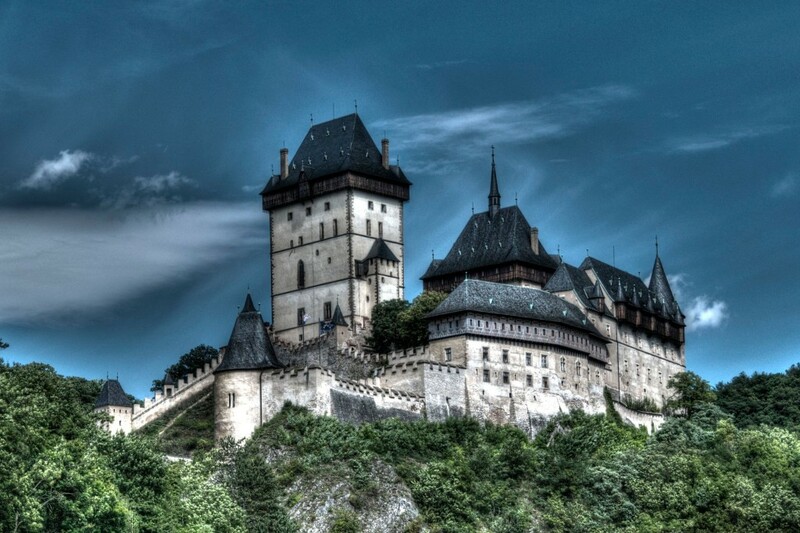 Karlštejn Castle, established in the 14th century by the legendary King Charles IV, is one of the most beautiful and well-preserved gothic castles in the Czech Republic. Because of its close proximity to Prague (just 40 minutes by train), it’s also a popular day-trip destination for visitors and locals alike, and is one of the most common out-of-Prague tour excursions offered by pretty much every tour company in the city. But it’s not at all necessary to have someone take you there. It’s really easy to do on your own. So read on if you want to learn exactly how you can get there yourself, and if you wish to learn a bit about the history of this important national landmark. 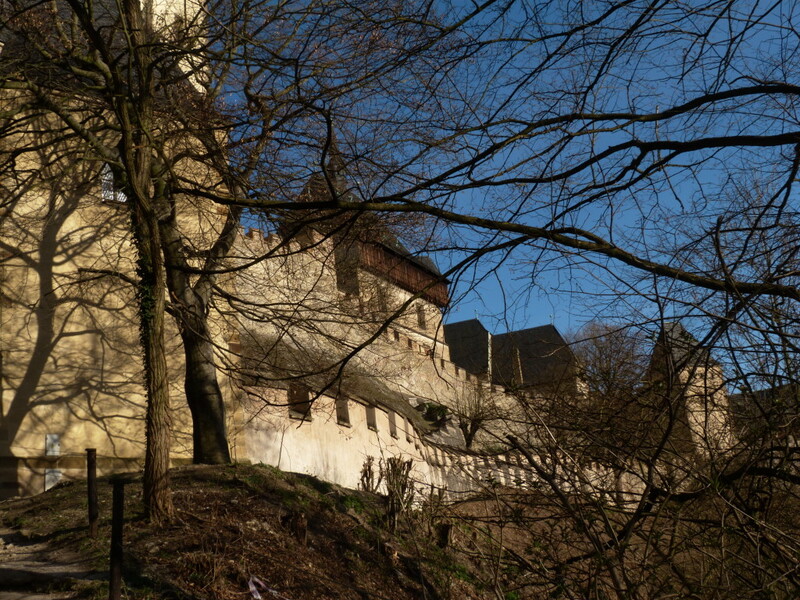 Karlštejn Castle was not used as a location in the filming of Game Of Thrones, nor did it appear anywhere in the Lord Of The Rings. Photo by Lukáš Kalista. Karlštejn Castle is located southwest of Prague on the promontory of a hill called Kněží Hora (Priest’s Mountain) overlooking a small village in the Berounka River valley. The hill on which the castle stands is in the midst of a number of other hills of slightly larger size, so that the castle is not visible from a distance and can only be seen clearly once it is approached on the road leading up to it through the village. 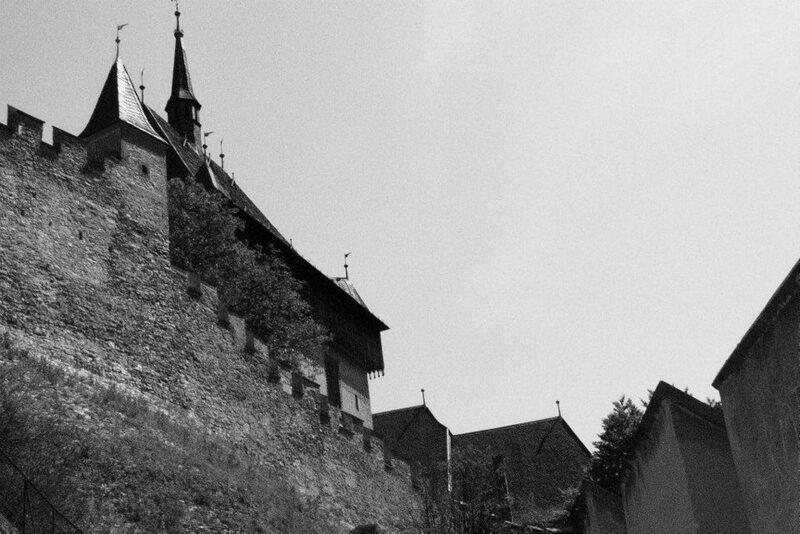 This was perhaps an intentional choice on the part of its builders, so that the castle could not be easily found by potential invaders. The castle’s construction was begun in 1348, and it was originally intended to be a residence of retreat for King Charles, who was not only king of the Czech lands but also the Emperor of the Holy Roman Empire (so one must assume an incredibly busy man in need of an occasional break from his royal responsibilities). However, during the building process, the structure was re-purposed slightly, and it was also molded into a place of safe-keeping for the imperial crown jewels, which were eventually secreted away in the Chapel of the Holy Cross. During its construction, King Charles stayed at the castle for the first time beginning in 1355, during which period he supervised the decoration of the castle’s chapels, and in 1357 the great hall in the small keep was transformed into the Church of St. Mary. Construction was completed in 1365 with the consecration of the Chapel of the Holy Cross in the great tower. The castle’s exterior and courtyard are open to the public, but it’s interior can only be seen by guided tour. 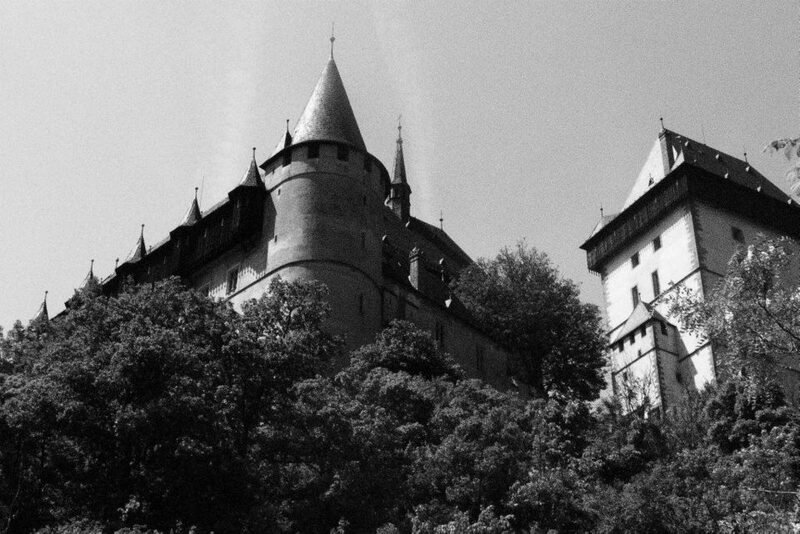 Check the official Karlstejn website for more information about the tours. 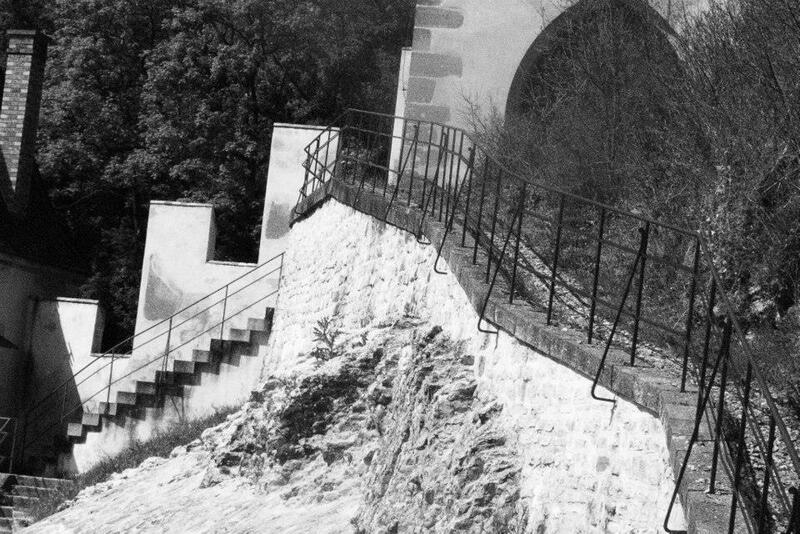 Over the centuries, Karlštejn’s appearance has changed somewhat from its original form. In the period 1578-89, there was a great deal of Renaissance remodeling done by the architect Ulrico Aostalli, but then the castle was damaged during the Thirty Years’ War (1618-1648), after which it fell into a long-lasting state of disrepair. It’s current appearance is the result of work done in the last decade of the 19th century, designs which were implemented by architect F. Schmidt, and then adapted and completed by Josef Mocker in 1897, and there have have been no further additions since that time. Karlštejn Castle can be reached easily by train from Prague’s main station, Hlavní Nádraží. 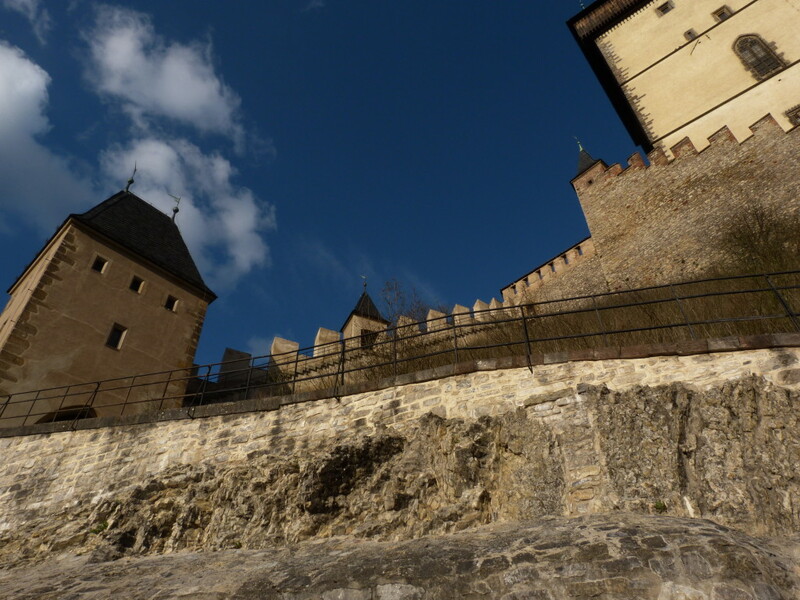 The castle lies on the Beroun line at the stop named “Karlštejn”, and the train leaves and returns about twice an hour for most of the day and evening. You can use the IDOS website to find schedule information. (If the site comes up in Czech when you click on the link, look for the tiny, hard-to-see English icon in the bottom right corner of the blue box.) It’s a direct line, so there’s no changing trains anywhere, and the trip takes approximately 40 minutes each way. 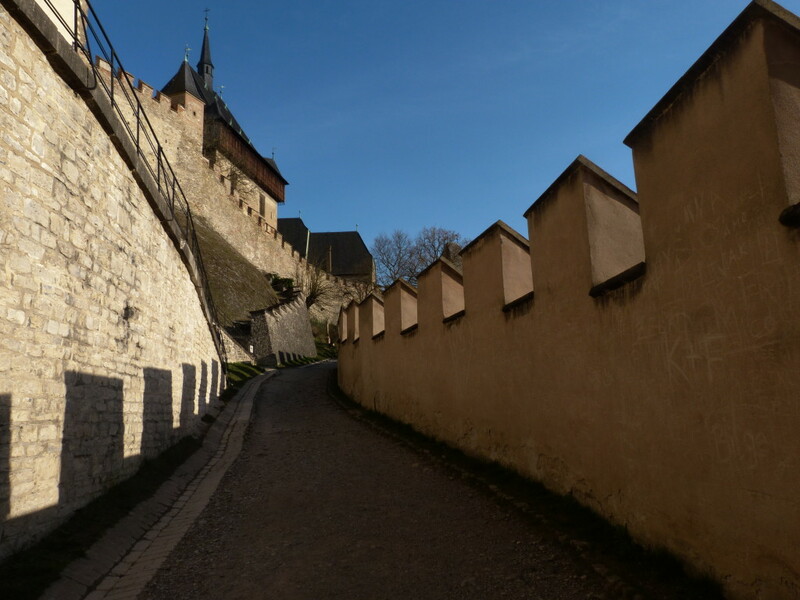 Once you arrive at Karlštejn, you’ll have to walk for half an hour or so to get to the castle, some of which route goes steeply uphill. As you come out of the train station, take a right and then walk a couple of hundred meters and take your first left. This road takes you over the suspension bridge which crosses the river Berounka. Once on the opposite bank, go to your right and follow the road upwards through the village. Pretty soon the castle will be looming over your head. You can’t miss it. (It’s not a major endeavor to walk there, but for those who feel the need, you can always catch a taxi or horse-drawn carriage for a couple hundred crowns.) The road through the village is lined with gift shops, pubs, and restaurants, some of which are typical tourist-trap affairs, and some of which are quite nice. You should be able to see for yourself what’s what. Many of the pubs and restaurants have outdoor seating, some of which have castle views, and most of them are pretty reasonable price-wise, about what you’d expect to pay in Prague.